(Last Updated : 15.10.16). Download CTET SEPT 2016 Answer Key Paper-II (TGT Maths & Science) exam held on 18.09.2016. CTET PAPER-II Answer key 2016 are available here for the Exam SEPT 2016, May 2016, FEB 2016 for Maths & Science. Official answer key of CTET SEPT 2016 exam for paper 2 (TGT Maths & Science) has been released by CBSE on 15.10.16 on the official website i.e. www.ctet.nic.in. Check here CTET 2016 (Sept, May & Feb) paper-2 answer key for Mathematics and Science for all sets - Set M, N, O, P.
CBSE conducted CTET SEPT 2016 exam on 18th Sept 2016 for level-1 & level-2. Official answer key of paper-2 of CTET Sept 2016 exam released released by CBSE as per schedule. Here you can check unofficial & official paper-2 (Maths & Science) answer key of CTET 18th Sept 2016 exam. Design alternate teaching-learning and assessment methods. Note : Rest of the question-answers will be updated soon. CBSE conducted CTET May 2016 exam (postponed re-exam Feb. 2016 of Haryana) on 8th May 2016 for level-1 & level-2. Official answer key of paper-2 of CTET May 2016 exam has been released by CBSE on 14.05.2016. Here you can check official paper-2 (Maths & Science) answer key of CTET 8th May 2016 exam. Get official answer key of CTET Exam 21.02.2016 for paper 2 TGT Maths & Science here. 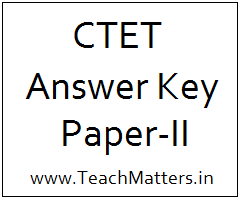 Official answer key are available on the official website of CTET i.e. www.ctet.nic.in. Download CTET Paper-II official answer key Feb. 2016 for Maths & Science. Only A (what difficulties would we face if our bodies did not have muscles in it? There is a pair of balanced forces acting on it. Note : This answer key will be updated* at regular intervals. So stay tuned with us for CTET Paper-II Answer key of May & February 2016 exam. i have been waiting for maths & science answer keys for the past 2 days.